5am and the alarm goes off, what the hell am I doing is my first thought. True to form all my gear had been laid out the night before, at this ungodly hour I want to have the minimum of fuss, so a quick toilet break and change and myself and Woody set off for our journey to the start. A few blocks down from our hotel is Times Square, 5am and the lights are still glowing bright. There’s people milling around even at this hour taking selfies, there’s a man preaching about Jesus the saviour, even he can’t help me now, I think. A quick left turn and we’re heading towards the city library, the meeting point for our lifts to the start. We gather into the wave of runners heading towards the large queues that are forming, beside us are some English blokes, typical all this way and you’re next to an Englishman in New York, there’s very much something Sting-esh about this. His cockney accent seems more cockney as the time goes by and at this early hour it’s starting to grind on me. After about 15 or so minutes we’re funnelled onto the bus and the cockney bloke seems a distant memory and so begins the 90 minute journey….I wonder if I can sleep. Nb – I couldn’t sleep. After what seems an eternity we arrive at the start point, hordes of people filing off buses to join yet another queue, this time an airport style pat down. Show your number, put everything in a clear bag we’re told, there’s the army and many (well) armed police, I’m co-operating, I’m thinking. Despite the significant police/army presence no one is tense, this is a happy place. People are smiling and laughing, we look down at our watches, its 7.15am. My waves starts at 10.15am, ‘argh balls’ I say, ‘only another 3 hours to kill!’. Oh, just a note for those future NYC marathon entrees so that you are not unprepared. I unlike my colleague, Woody, took the sensible option and brought a jumper, you may want to consider this when standing/walking around. However, we were dwarfed in comparison to those people who brought lilos and blankets to have a kip, I did envy them. Skip to another toilet break and it’s time to get into the starting pens (just so you know I’ve worked out that 3 trips to the toilet is the optimum amount). After a bit of asking around Woody’s allowed to join me in Wave 2 (he initially put down for Wave 1) and after a couple of minutes the elite athletes are lining up, predictably the American National anthem pipes up, they’re properly belting it out hand on chest and everything. I’m kinda envious of the whole national pride thing but nethertheless I don’t join in. Just as it’s in full flow 3 huge American helicopters fly over in formation, it’s no Red arrows but it’s still impressive. A few seconds later and from out of nowhere 2 huge cannons are set off, everyone thinks wtf and the first wave is off. Cue another 15 minutes and its Wave 2’s turn, everyone shuffles towards the start, repeat as wave 1, national anthem, 2 cannon and Frank Sinatra’s New York, New York starts bellowing out, we’re finally off! The fist mile and a half is over Verrazano-Narrows Bridge, everyone’s jostling to find some space, Woody decides to be unconventional and darts onto the skirt of the bridge, I follow. We think we’ve found the perfect place, oh no other people have thought the same and it’s not long before we’re once again jostling amongst the masses. A few mile on the freeway (motorway to you and me) and we’re into the first housing estate, its adorned with typical styled American houses, the type you’ve seen in the films. It seems as is the American people have come out in force, hundreds line the streets shouting and waving flags and banners, I note one says ‘ONLY 23miles to go’….ONLY. The street is littered with the typical red brick houses with large staircases to the front door. Families are out, sitting on each and every step, hip hop blasting from the boom box, people are dancing and everyone’s cheering. This is why I wanted to do it I thought. Further down the street there’s a preacher outside a church, the end is nigh, says the huge bed blanket banner. I hope not mate, I’ve got a race to finish. With each pounding foot we move ever closer to towards half way, this time on the side of the street is someone rapping, it sounds awesome and as if possessed I unwittingly give him a black panther style fist in the air. 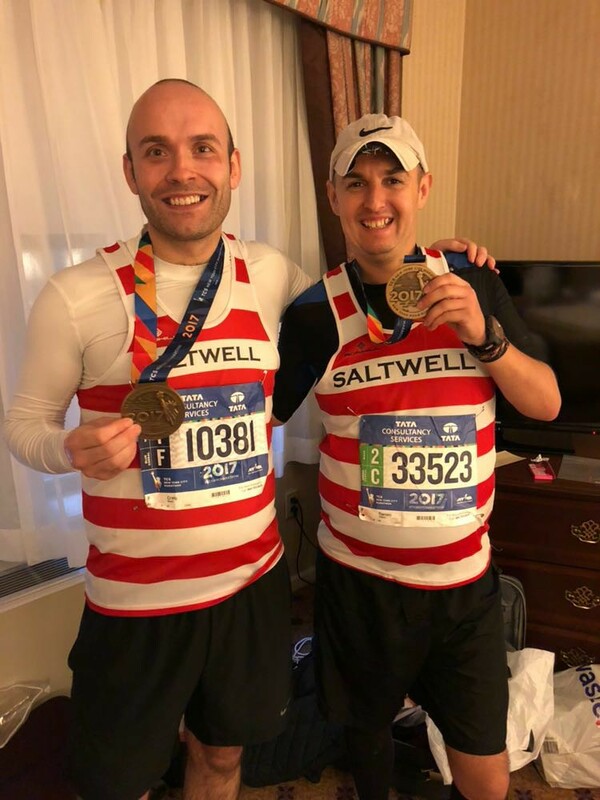 The whitest guy in the NY marathon from the most northern city in England giving him a fight the power sign, I think we’re all caught up in the moment, he gives me the thumbs up and shouts go on Saltwell. We both move on, I just got a shout out from a street rapper, I’m made up, my brothers would be proud, if not a little embarrassed. The next set of miles go by, each as entertaining as the rest. I’m slowly regretting my decision to take a drink from every drinks station (every mile btw), the gatorade has went right through me, I try to put it off, no use, toilet break it is. It’s at this point I feel sorry for Woody, who is basically standing around waiting for me to pee, he doesn’t complain. He’s been having too much fun running in and out of people trying to high five them on the side of the road. We set off again. There’s three points during the race that I’ll never forgot, the first of which comes soon after the pee break (the others I’ll get to). We turn into what can only be described as the Jesmond of Brooklyn, there’s posh coffee and cake shops, mini little stores, it looks high class and the posh people look as if they want to watch the poor run, maybe it reminds them of the time they released the hounds on the beggars coming to their door, who knows! The locals start encroaching on the course but unlike most races no one minds, they’re three or four deep and screaming encouragement. I can only describe it akin to being on the tour de france people are in front and to the side of you shouting encouragement, patting you on your back and high fiving you. I don’t mind admitting I choked up a little, this was better than I could have ever imagined and I’d been waiting a long time to run it. The moment went over all too fast. At about the 15 mile mark woody gets a message, Linda and Gemma are at the 16 mile mark. Unbeknown to Woody, albeit I was trying to hold him back more for pace purposes, I was struggling. As usual it was more mental than physical, 16 mile is always a difficult one for me, all those miles down and still double digits to go. The thought of seeing our support gave me a little lift. The next part of the race is my second memory. We were fast approaching the 16 mile marker, we were coming off a bridge where there was next to no support (there were no sidewalks – pavements for Phil Askew) and coming down a hill to turn back on ourselves for the next stint when there was a massive wall of cheering people, it was at least 5 or 6 deep. People were up on boxes or anything they could find to get a better view, I was scanning the crowds left to right to see if I could find our support. We were passing fast, I’ve missed them I thought. From out of nowhere two beaming faces popped up above the crowds shouting and screaming ‘Darren, Woody, Saltwell’, it was Gemma and Linda. Me and Woody both spotted them, I was particularly happy to see them both, it came at the perfect time for me just as I was struggling. I must have looked like an idiot for the next 2 minutes with my grinning face. I knew that the next part of the race was a virtual 5 mile straight upto the Bronx, as with all the race there was plenty of support either side of the road. I felt good after seeing the girls and then it happened, the dread for any runner, the twinge. I tried to put it from my mind but I couldn’t. I could sense my slowing down, I turned to Woody and simply said, ‘I’m sorry mate, I think this is me’. He tried his best to encourage and I tried to go a little further but I thought that I needed to maintain at a slower pace and it seemed unfair to Woody who had clearly been running within himself besides me for the previous 19/20 mile, ‘nah mate, you go on’. I walked for a minute or two and set off again. About a half a mile up the road there was a turning point where you came back on yourself I saw Woody through a gap in the buildings, he’s not too far ahead I thought maybe I can catch up. That’s the mindset of a runner right there. No sooner as I got to the point where I had seen Woody that I got cramp. For whatever reason it always seems to happen around 20/22 mile, I got cramp in my knees both of them. Let me tell you, it hurts! I had thought by drinking at every water station and taking on board food during the race that this time it might not happen. Unfortunately it did. This is the one, not regret, but slight disappointment of my marathon, the fact that I couldn’t run it all the way. I had secretly hoped I could still get under 4 hours and as the pacers slowly went past me, the runner in me still thought I could still get under 4 hours, I reluctantly admitted to myself it was no longer possible. It was time to get over myself and enjoy the remainder of the race and soak up the atmosphere. The last mile or so came into sight, the finish was in central park and you dipped in for about 3 quarters of a mile then went back on the outside of the park along the road. It was at this point I met some runners from Middlesbrough a.c, ‘alright Saltwell, how you doing, do you want to run in with us?’, ‘im injured’, came the reply, ‘just crack on’, ‘nah, so’s the misses just come in with us’ he said. After about a minute of running came, ‘so do you know James May?’, I laughed, you can’t go anywhere without someone knowing a hoop! The last mile was basically a procession, my new found Middlesbrough a.c mates kept me on the right path and we all encouraged each other, none of us stopping. I even had the pleasure of seeing the support crew of Linda and Gemma just before turning onto the final straight shouting and waving, once again me grinning from ear to ear, this time however I didn’t require as much encouragement as the finish was insight, I’d just about done it. Now comes my third memory the final straight. As you can imagine, and a general theme within this report, the final straight was packed to the rafters people from all walks shouting and encouraging, ‘nearly there’. I know I thought I can see and my legs are telling me too! The expected arms loft didn’t quite materialise and, as someone commented, it looked more like I was doing jazz hands and for Claire Lloyd, you now know who I was hugging at the end, it was my new found Middlesbrough mates helping me through the last mile. As I finally crossed the line and there was someone waiting with my medal. This is the point I most came to crying, even now writing this I can feel some emotion coming through remembering that feeling. I had finally done it, after 7 years of trying I had finally realised my dream of running the New York marathon. I looked down at my medal and let it sink in for a minute or so and then the biggest smile came over my face. I had finished in 4 hours 8 minutes and 19 seconds. I think back to the start when I turned to Woody after seeing a guy wearing a gopro and remember saying ‘who’d want to look back at four hours of running’? The answer, I now know, was me. Heading back to the hotel, I had no phone or way of contacting anyone, my thoughts turned to whether or not I could have done better. Maybe. With marathons cramp is my nemesis, I felt fit and I’d gotten over my mental barrier on mile 16 but what the hell, I do not have a single regret. This was my dream and I thought I’m not wasting time on what could have or might have been. On the way back I bumped into Craig who was waiting for me, we messaged the girls and agreed to meet at a point further down the road. The girls were as happy to see us as us were to see them. The walk back to the hotel was a recant of the sights and sounds of the previous 26.2 mile and we couldn’t resist getting a hotdog from a vendor, after all when in New York. The conversation then turned to what to do tonight, ‘What do you think, let’s drink, we’ve all earned it!! !’ was the reply. I think this is supposed to be the point, in my best Jerry Springer style summarisation, I give some meaningful, poignant last words and I’ll try…. For me, New York is one of the best places on the Earth. We all have a perception of American people from films and the News and I can safely say its rubbish. You couldn’t meet a bunch of more friendly and genuine people anywhere, say for Newcastle (I know my audience). The whole of New York made my dream more special than I could have imagined and I’m also thankful that I had the best company anyone could have hoped for to share it with in Craig, Gemma and Linda. After supporting Phil James and Naz on their 60 mile White rose ultra last year I decided I wanted to do one. So after chatting with a few people who have done ultra marathons I decided to join some of my fellow hoops and signed up for the 30 mile White rose ultra. Team Saltwell consisted of Naz and his side kick Phil James, Lois, lisa Stephenson, Rob Masson, Harra the Legend, Scott, John Longstaff, The two Joannes, Barry and paul who are mates of Harra and Phil James and me. The night before the race we decided to register and collect our numbers from the race HQ. So glad we did as we realised the hotel was further away than we thought. The night before was mainly fueling and resting before the big day. Race day started with a 5:30am wake up and leaving the hotel at 6:30am to make our way to race HQ. Standing in a room at the race HQ surrounded hundreds of ultra runners I felt a bit out of my depth but after a few hugs and manly hugs from my team mates, I was ready. It was already decided that the two Joannes would stay with me on the race. Our tatics were to walk the hills and run the down hills and the flat. Team photo done, it was time for the race to start. Off we went straight up a hill. Walking it seemed to be most peoples race tactic too. Phil James’ mate Paul decided to run with me and the two Joannes. After a couple of miles of walking up hills and running down hills I thought to myself, I’m enjoying this. Then It came to the long slog up the highest point of the race where the first water point was. It was windy and cold at this point which showed why we needed the kit. 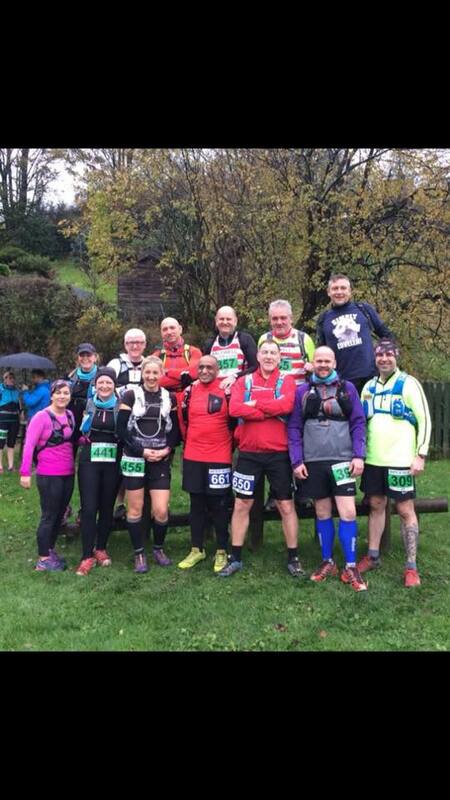 What I can remember of the first 10 miles was hills, more hills and mud. We had a great support crew of young swanny and Steve Anderson on their bikes for 27 miles of this race. We reached the first check point and we welcomed by Alison Slaymaker, quick re fuel and we were off again. 15 miles into the race we had to walk up a massive hill that just kept on going and getting steeper. By this point I was getting tired, my legs were hurting and I was sick of going up hills. My good mood had started to go and I was finding it tough. We reached the top of this hill to have to go down a steep muddy path. I knew from supporting at the race last year that we had to go around some pylons and we could see them but everytime we seemed to get close to them there would be a sign to go a different way. We eventualy reached about mile 18 and Alison was there with food for us. At this point I was feeling sick, tired and in pain from all the steep hills and steep down hills. I realy wanted to quit. Ive never felt so down in a race. We plodded on walking up the hills and running when we could. The terrain in some parts was horrible and hard even to walk on. At mile 26.2 Joanne Anderson asked if I had ever done a marathon. My reply was no. Then her reply was you have now. For some reason I got my second wind and I was starting to enjoy it again. Then we realised we only had 3 miles to go. By this time Joanne Wollaston was struggling and in pain. Then at 28 miles she told us to go ahead and leave her in the safe hands of young swanny to support her to the finish. So off we went thinking get in, we have done it, until we turned a corner at mile 29 and there it was another massive hill to climb. I mean, what person puts a massive steep hill that close to a finish of a race? Do they not think we have gone up enough hills? We got to the top and I was struggling to keep up with Paul and Joanne and struggling to not be sick, so I told them to go on without me. Afer a quick spew in a bush I was off again but the last half mile I was getting pulled along by two ladies who we had kept overtaking for most of the race. It was a case of saying to each other “come on we can do this” with a few swear words. This last half mile we overtook a few other runners and I was thinking where the hell is this finish. Then all of a sudden Phil James appeared and told me I had only 100 metres to go. The two ladies and I managed to find enough speed and energy to look good over the finish line. I thought to myself, yes, Ive done it. I was in so much pain and so tired but could not believe that I had just done my first marathon and ultra marathon in the same day on such a hilly brutal course. Now it was time to get hugs from my team mates. I would like to thank everyone who has trained with me and given me advice and to all the very generous people who have sponsored me to do this event. As I type this I have raised £1000 for the Huntingtons disease association. During this event I met loads of lovely people. Cant wait to do it again next year to beat this year’s time.